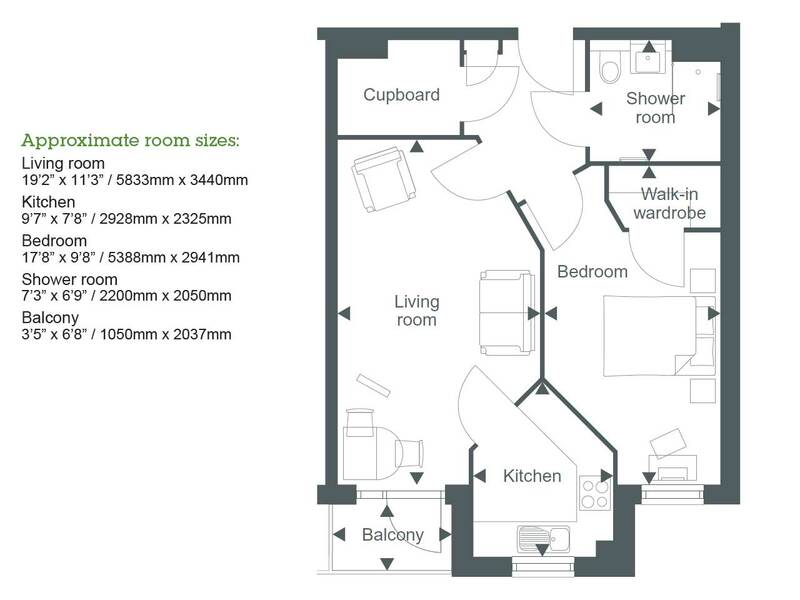 Apartment 22 (Plot 23 on the site plan) is a one bedroom apartment situated on the third floor with a westerly aspect and a balcony. Located in the heart of the bustling town of Maidenhead, Elgar Place is an ideal option for those seeking a new build retirement apartment in this attractive riverside town. 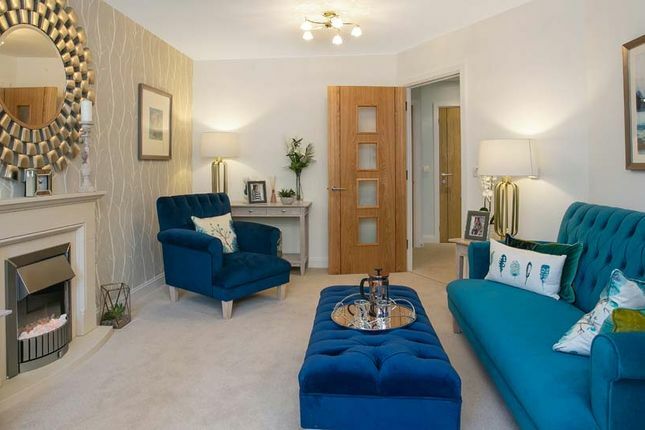 This modern Retirement Living development offers a collection of stylish one and two bedroom apartments exclusively for those over the age of 60. Elgar Place features balconies to selected apartments and a delightful roof terrace with contemporary furniture and colourful landscaping for homeowners to enjoy. The apartments are light and airy, with thoughtful features such as waist-height plug sockets, a modern ivory-gloss fitted kitchen, electric kitchen window and energy efficient heating and car parking is also available to purchase. Situated in the Royal Borough, the development benefits from excellent access to many surrounding areas of interest including: Bray, Windsor, Reading, Marlow, Henley-on-Thames and High Wycombe, plus significant improvements are being delivered at Maidenhead station as part of the Crossrail programme. The town centre is just a short distance away, with amenities such as Waitrose, stylish eateries and High Street stores a stone's throw from the doorstep. Elgar Place has been named after Sir Edward William Elgar, who was an English composer. Elgar was a resident in the Maidenhead area and locally performed, taught and composed. Now there are even more ways to make your dream move to retirement at Elgar Place. As well as buying an apartment outright, we now offer Rental options and Part Rent, Part Buy options. Contact us today to find out more. Maidenhead lies south of the River Thames and is surrounded by the stunning Berkshire countryside. The name ‘Maidenhead' originates from ‘Maiden Hythe' and the town dates back to Saxon times – giving it a deep routed English history that adds character top the area. The town is well known for its charming community spirit with a large amount of entertainment and leisure facilities found alongside restaurants and country pubs. The local cinema isn't far from Elgar Place either and there is also a vibrant town hall which offers an array of sociable activities throughout the year for you to enjoy. A library, local arts centre and leisure centre offering numerous sports and activities is also close at hand, while history fanatics can enjoy a tour of Maidenhead Heritage Centre which was established in 1993. Local amenities found on the doorstep of Elgar Place include; Waitrose, a florist, numerous banks and a variety of High Street names in the Nicholsons Shopping Centre. Local eateries that come highly recommended and are well worth a visit include; The Belgian Arms, Thai Orchid, Francesco's Italian and the riverside bar and restaurant, Boulters. Visit us, explore, and see for yourself the sought-after location Elgar Place offers! If you are using a Sat Nav system please use the following postcode: SL6 1RR The postcode for Elgar Place is newly created by Royal Mail and may not be accurate for some months. Property descriptions and related information displayed on this page, with the exclusion of Running Costs data, are marketing materials provided by McCarthy & Stone - Elgar Place, and do not constitute property particulars. Please contact McCarthy & Stone - Elgar Place for full details and further information. The Running Costs data displayed on this page are provided by SmartNewHomes to give an indication of potential running costs based on various data sources. SmartNewHomes does not warrant or accept any responsibility for the accuracy or completeness of the property descriptions, related information or Running Costs data provided here.